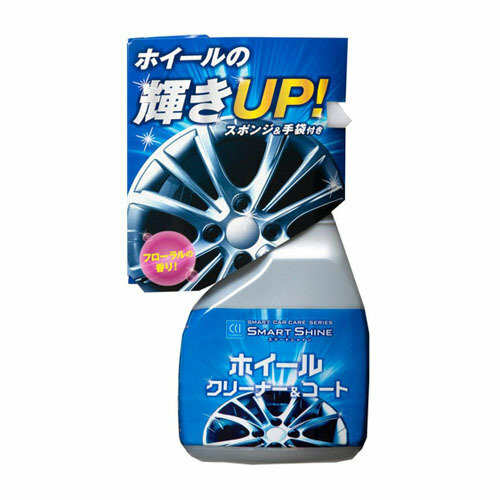 The persistent brake dust and pitch tar can be taken easily with special cleaning ingredient formulation. The shine of the wheel is also up! Thanks to the strong water repellent coat, it is hard to get dirty. Preventing adhesion of dirt so the beautiful wheel lasts longer! Leave the tire cleaned! Because it does not use acid or compound, it is easy for tires as well as wheels. 1. Rinse sand / mud soiling on the wheel and tire with water. 3. Spray on wheels and tires. ※ Do not use for magnesium wheels, wire wheels, special coated wheels, or plating with weak surface treatment (sputtering etc.). 4. Rub it with a sponge and let it dry. ※Please be aware that it will cause scratches if rubbing strongly. ※ Please use protective gloves. 5. Rinse thoroughly with water so as not to leave liquids and dirt. ※ Please note that if the liquid is left to dry and insufficient water is applied, there is a risk of discoloration or stains. 6. Wipe off any remaining water drops with a towel.